Who is eating my flowers in the garden ? Even if they are not always appreciated by gardeners, some butterflies can use garden plants as foodplants for their clutch. Anyone should be aware of the luck to witness such natural histories directly in his own garden (and feel even proud of this !). 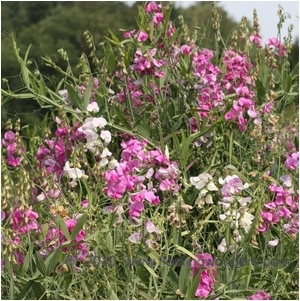 The damage done is not that important and never threatens the plant itself. So... no pesticides and high consideration, please ! 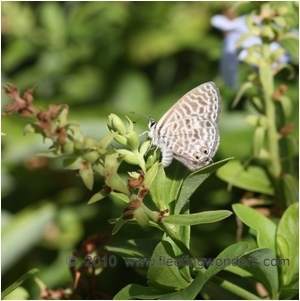 Although it is an imported plant, it is perhaps the main foodplant for Lang's Short-tailed Blue (Leptotes pirithous) on the South coast of France. 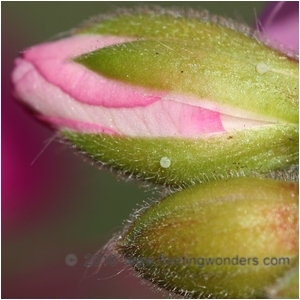 On the picture, a female is laying an egg on the flower bud. 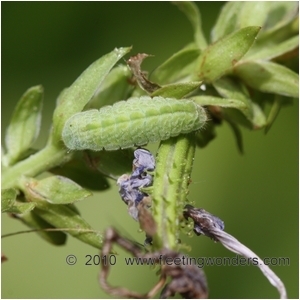 The last instar caterpillar of Leptotes pirithous. 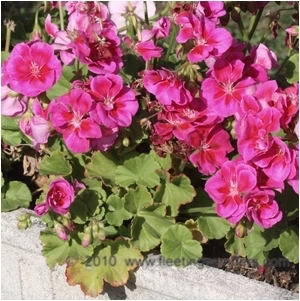 Geranium zonale in an urban garden near Paris (Sartrouville, Yvelines France). 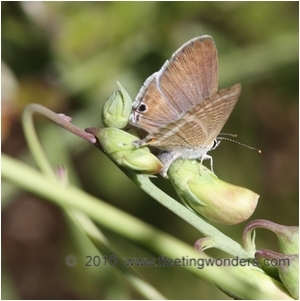 The Geranium Bronze butterfly (Cacyreus marshalli) was sometimes seen in this garden at the same period. 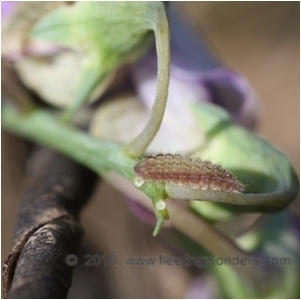 A careful examination of the flower buds revealed some Lycaenid eggs which were those of this african butterfly. Geranium Bronze has been colonizing the South of Europe for a decade now... 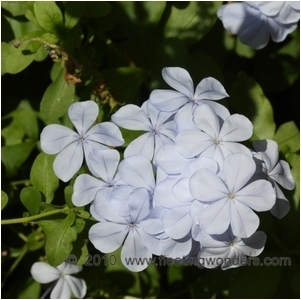 It was probably imported unintentionaly from South Africa to Spain with some heads of Geranium. 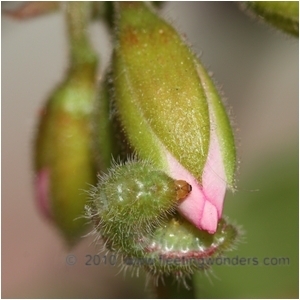 When looking attentively on the buds some small caterpillars of Geranium Bronze could be seen. 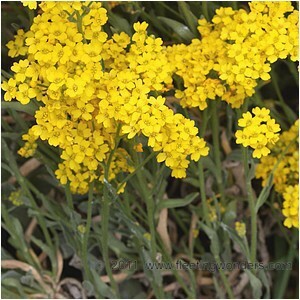 Their colours and patterns are perfect and the larvas are definitely invisible on the flower stems. 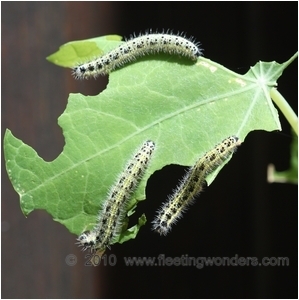 Thanks to their purple excrements that accumulate below them (on leaves), the larvas are easy to spot all the same. 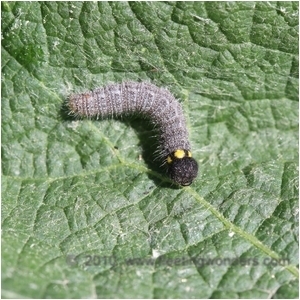 They prefer eating the buds themselves and they stay on flower heads most of the time. 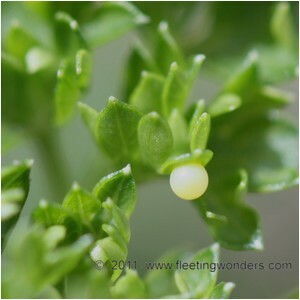 It seems that the close species Geranium peltatum is less often chosen by females for laying their eggs. Nasturtium (Trapaeolum majus) is a common flower in gardens or balconies. 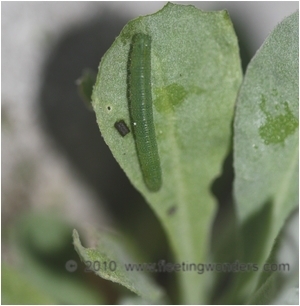 Sometimes females of Large White (Pieris brassicae) lay their eggs on this foodplant which is really amazing since usually they choose foodplants of family Brassicaceae. 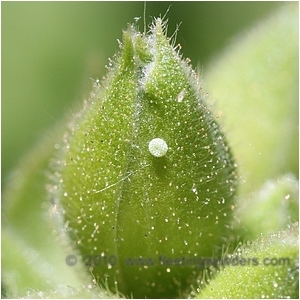 The eggs are laid in clusters and the caterpillars live gregariously . 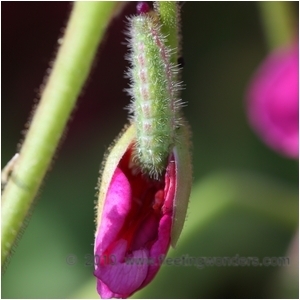 The Everlasting Pea (Lathyrus latifolia) is a foodplant actively searched by females of Long-tailed Blue (Lampides boeticus). 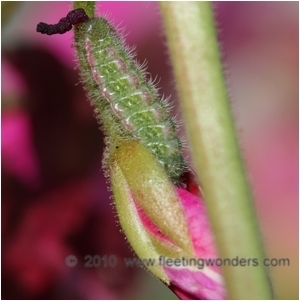 The eggs are laid on buds and caterpillars are sometimes seen on the stems albeit scarcely. 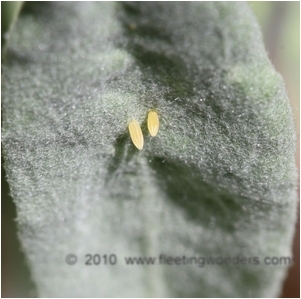 A couple of eggs laid by a female of Small White (Pieris rapae) on Alyssum saxatile (Brassicaceae) and a young caterpillar. 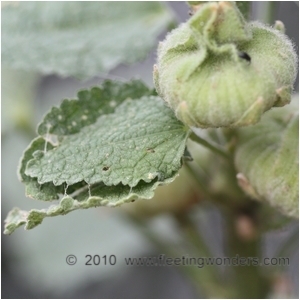 Mallow Skipper (Carcharodus alceae) often lays some eggs on Hollyhock (Althaea rosea) of family Malvaceae. 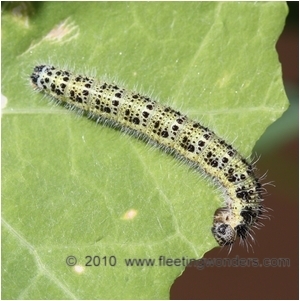 The caterpillar builds a harbor by folding a piece of a leaf then fixes it with silk (see the first two pictures above). 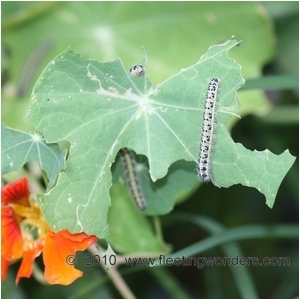 The caterpillar stays inside this harbor and eats the leaf without moving out of it. As the size of the caterpillar increases, another harbor will soon be made not far from the previous one. 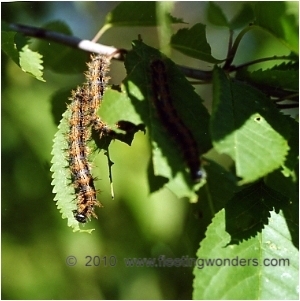 Gregarian caterpillars of the Large Tortoiseshell (Nymphalis polychloros) on a Cherry Tree (Prunus cerasus) in a garden. Apple trees (genus Malus) can also be selected by females. 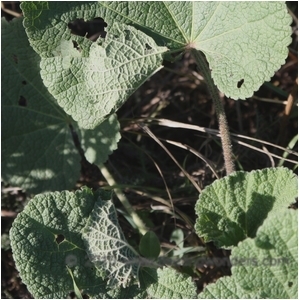 The damages done to the leaves remain mild and do not impair the global fruit production of the tree. 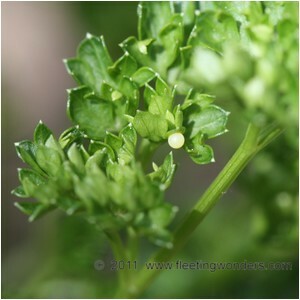 Egg of Swallowtail (Papilio machaon) laid on Parsley (Petroselinum crispum) in a garden. Swallowtails also use carrots heads (Daucus carota).